Your video binging is killing the planet. This new chip could be the solution. We know we shouldn't throw plastic six-pack rings in the ocean, that we shouldn't take long luxurious showers during droughts, and that we shouldn't burn toxic waste in our backyards. But when it comes to protecting the planet, we don't usually think about cutting back on our streaming addiction. Yet it's true; our binge-watching has a serious environmental footprint. It's estimated that the U.S.'s data centers—the computer farms where web companies like Netflix, YouTube, Hulu, Facebook, Spotify and Vimeo store their content—consume as much power as the entire state of New York. Recent reports suggest their carbon emissions are on the rise, growing by more than 10% a year. Much of that is driven by video streaming, with Netflix estimated to take up nearly 37% of the Internet bandwidth in the U.S. during peak hours. Our appetite for video is unlikely to wane any time soon. That's why researchers from the University of California-Berkeley, MIT and the University of Colorado are so excited about a new computer chip they've developed that promises to increase efficiency and decrease the carbon footprint of cloud computing. In a paper published Wednesday in the science journal Nature, the researchers describe an electronic-photonic chip, the first computer chip that uses light, instead of electricity, as the highway for information. It's theoretically a win-win: it would lessen the ecological toll of our computers, plus nothing travels faster than light. This "is a real tour-de-force," said Rajesh Menon, a photonics expert at the University of Utah who wasn't involved in the study. It's up to 50 times faster than today's commercially available chips, according to the researchers. The chip, which can run simple programs, won the $200,000 MIT Clean Energy Prize earlier this year. To understand why this is so momentous—and why it might herald the era of green(er) computing— you have to understand a bit about machine anatomy. In a computer, you have memory, where data is stored, and then a processor that crunches that data. If you want to watch a video, for example, that huge file needs to travel from memory to the processor. Engineers have spent countless hours trying to figure out how to make that trip speedier. One trick is to put the memory and processing units as close together as possible—but this has obvious physical limitations. Another, more ambitious, alternative is to revamp the connections between the two. That's what the authors of the Nature paper did. Right now, those roadways consist of copper wires that transmit electrons. Electricity is just the fast flow of electrons—and it's that flow that carries your data. But copper is like Amtrak, slow and inefficient, with lots of friction. So a lot of resources are spent propelling those electrons forward, hence all the power consumption. In contrast, the "route" in this new chip is like a minuscule Hyperloop, the high-speed, energy-efficient concept train dreamed up by Elon Musk. Tiny fiberoptic cables transmit photons, or particles of light, which create much less friction, reducing the power needs of the system. And because photons in a fiber can travel considerably farther without losing signal, it doesn't matter if the memory and processor are kilometers away. Researchers can also use different wavelengths of light to simultaneously transfer data to increase bandwidth on a fiber. Here's the hard thing though—and where physics comes in. You can't use copper wires to transmit photons. Copper is good at shuttling small particles, like electrons, but not relatively humongous photons. Think of a freight truck trying to fit underneath a small tunnel. So you have to build from scratch. The relays between the memory and processor must be optical to harness the power of the speed of light. Yet, the memory and processor have to be electrical because scientists haven't figured out how to make optical versions. (Whether that's even possible is hotly debated topic, experts told me.) Making a hybrid system is difficult because the electrical and optical components are built using different, often incompatible, methods, but the researchers figured out a way around this. They built their new computer chip in facilities used to mass-produce the ones inside our laptops and mobile devices without altering the manufacturing process at all. "This wasn't possible before," Laurent Vivien, a silicon photonics researchers at the Insitut d'Electronique Fondamentale in Paris, told me. "Now they can make what they want…with no extra [investment in] development. It's something that can have a huge impact." And the prototype chips work, meaning that they run software, like an image rendering program, and data does travel from memory to processor and back—using light! Teapot rendering done with the new photonic chip. The semiconductor industry—the companies that build the world's chips—is worth a whopping $300 billion. Companies like Intel and IBM are super hesitant to change how their chips are mass-produced because the financial repercussions could be huge. The fact that these researchers were able to incorporate optics manufacturing into existing factory production lines is potentially revolutionary, as Vivien implies. It means that it's more likely that these new hybrid computers will be assembled cheaply and make their way into the data centers that feed our video-binging addiction. Making data centers more efficient would mean our entire online experience would get better. Eventually, these energy-efficient chips could also make their way into consumer devices like sensors, robots, vehicles, smartphones and laptops. "Imagine if you didn't have to plug your computer in for a week," Vivien said. "This could be very powerful." For that to happen, though, the chip needs to be beefed up so it can run the complex operations our current machines are capable of. It only has 70 million transistors, the switches that actually run computer programs. To put that in context, the Intel chip that's in my Mac has 731 million. Some of the most high-tech chips on the market today for video processing have 8 billion. The more transistors a chip has, the more calculations it's able to do in a set period of time. To make the new chip truly revolutionary, scientists will need to add more. The Nature study is the culmination of 10 years of work, Chen Sun, one of the authors of the study told me. The research is part of a booming field called integrated photonics, which aims to miniaturize optical computing elements, usually in tandem with electrical ones, to supercharge the capabilities of machines. There has been lots of interest from industry, governments and academics in the field because everyone is hungry for faster, energy-efficient machines. In July, the Department of Defense established the American Institute for Manufacturing of Photonics, a public-private partnership whose goal is to foster the development of electronic-photonic chips, with a $110-million grant. (The work that led to the new paper was funded by DARPA, the DoD's research wing.) An additional $500 million has been pledged by private institutions. 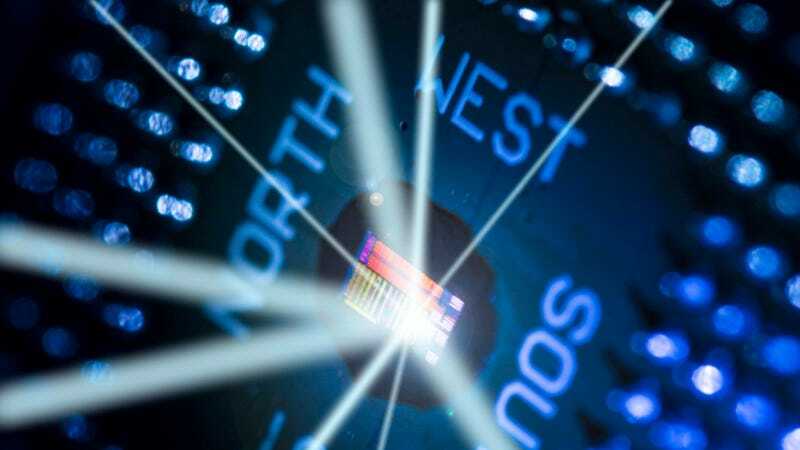 "Integrated photonics is clearly seen as the next logical evolution of the multi-billion-dollar semiconductor industry," said Menon, the University of Utah photonics expert. "The dream is that this would create a whole new industry." That's starting to happen. In May, computing giant IBM announced they had developed a photonic transceiver, which can shuttle data between computers in data centers. Intel has 19 job openings listed for its photonics team. Other computing companies, like HP, are also investing heavily in this field. The new computer chip described in Nature, which took five years to build and was Sun's PhD dissertation at the University of California, Berkeley, is now the foundation of a new startup called Ayar Labs. The small company recently joined Silicon Catalyst, a chip-startup incubator. Sun and his co-founders are in the process of raising $3 million to commercialize their work. "We don't want this technology to sit in the lab forever," the 28-year-old researcher told me. "We have high-enough confidence [in it] to take it on as a full-time thing." Physicist and Nobel laureate William Bragg once said that "light brings us the news of the universe." It may also bring us faster, greener computers. *12/30/15 The story was updated to clarify why optical fibers offer a benefit over copper ones.